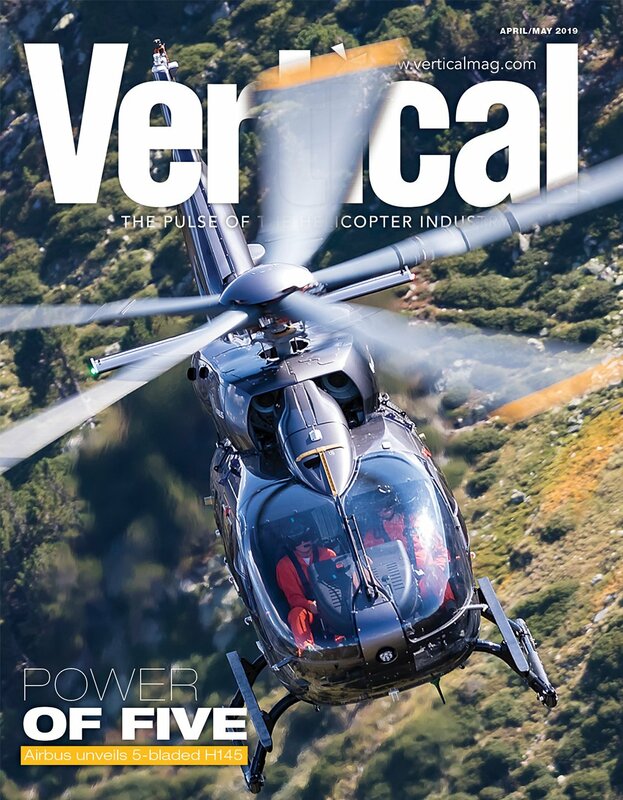 Editor’s Note: This is part 2 in a 3-part series on helicopter operations in South Africa’s Kruger National Park. 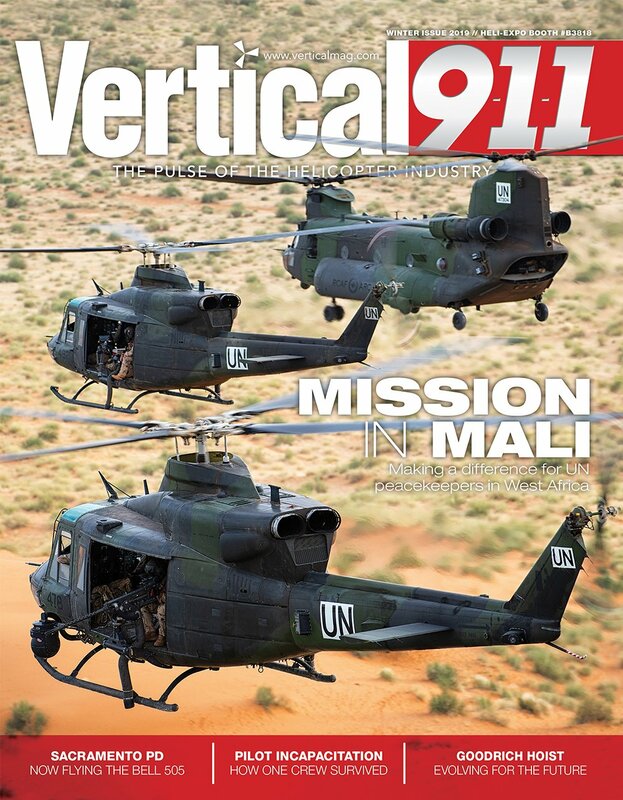 Follow the series at verticalmag.com/kruger. 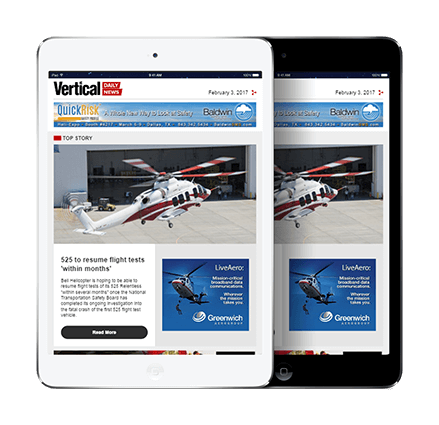 Our reporting was made possible with the support of Airbus Helicopters. Sometimes a wildlife darting mission goes according to plan. Sometimes the wildlife has other ideas. 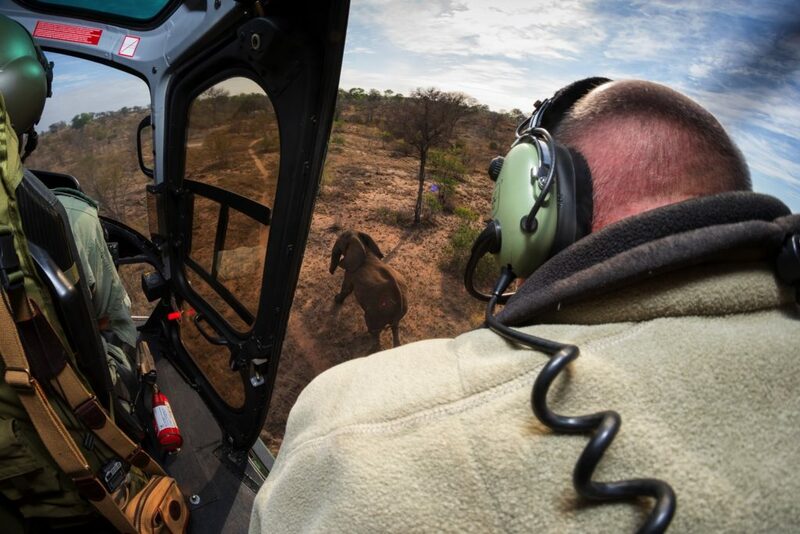 It has now been seven or eight minutes since the veterinarian in the back seat of our Airbus H125 helicopter, Dr. Peter Buss, took aim at the young bull elephant below us. It was a clean shot, delivering a cocktail of thiafentanyl, an opioid, and azaperone, a tranquilizer, into the animal’s hindquarters. At the doses contained in the dart, the drugs usually take full effect after 10 minutes. That’s a problem, because with just a couple of minutes left on his feet, this young bull is being stubbornly uncooperative. 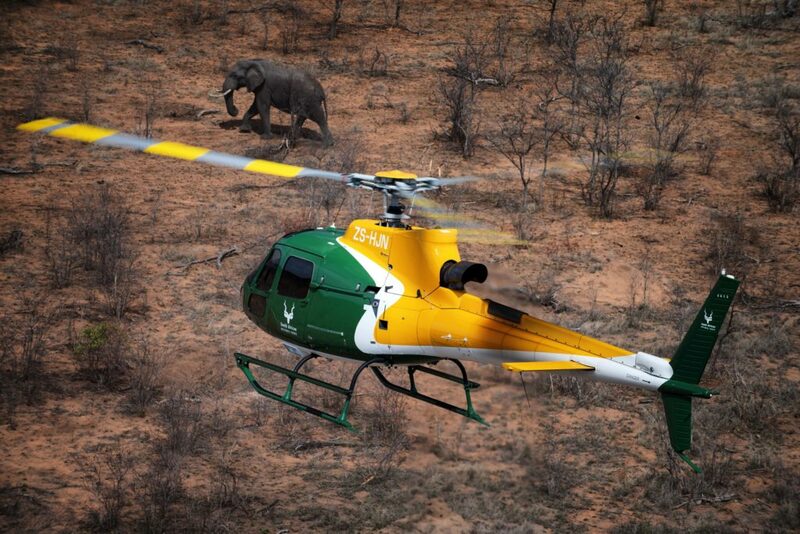 Pilot Brad Grafton is doing his best to urge him into a clear area, but the elephant seems impervious to our rotor wash. Instead, he keeps stumbling through the bush towards a tourist road in Kruger National Park, where a handful of safari vehicles have pulled over to watch the show. Finally the elephant pauses next to a small dead tree. He sways a little on his feet, then tips over on his side, bringing the tree down with him. It’s not the outcome Buss had hoped for. Grafton lands the helicopter and Buss jumps out to join his ground team, who are already at the elephant. They won’t be able to perform their research tasks on this one — his awkward position across the tree puts him at risk of injury, so it would be unwise to leave him there for long. Buss administers an antidote and returns to the aircraft. We lift off in time to see the elephant wake up and heave himself to his feet, then amble off, apparently unconcerned. Across the radio comes a general sigh of relief. Fortunately, the next elephant that Buss darts is much more tractable. He submits readily to Grafton’s herding, finally passing out next to a dirt road that’s far from the prying eyes of tourists, yet readily accessible to the ground crew. Grafton locates a clear patch of veld and lands again, this time shutting down. The veterinary team’s work is about to begin. Few helicopter missions are as challenging or rewarding as wildlife darting and capture — both from the perspective of the pilot, and the person with the dart gun in the back. “The big thing about darting wildlife is it looks fairly simple and straightforward, but it’s got multifactorial components to it to make sure that it’s successful,” said Buss. For the pilot, that process of managing the animal is a balancing act — knowing when to move in and when to back off. “You’ve got a bit of a goal that [you] set yourself, and that is to try to get the animal close to the ground crew and in safe proximity,” explained SANParks chief pilot Grant Knight. Yet at the same time, the pilot can’t become so fixated on this goal as to lose situational awareness. Maneuvering so low to the ground leaves no room for error, and even a surly, drugged-out elephant can’t be allowed to distract from the branches waiting to snag the tail rotor. 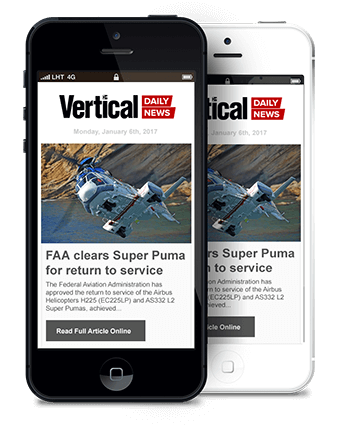 “You’ve always got to take a step back and realize you’ve got a tasking that’s flying safe; keeping the aircraft, the crew safe, and the guys on the ground safe,” said Knight. “It’s just important to always keep safety as the highest profile within your operation” — even if that means having to wake up an anesthetized animal and try for a different one. 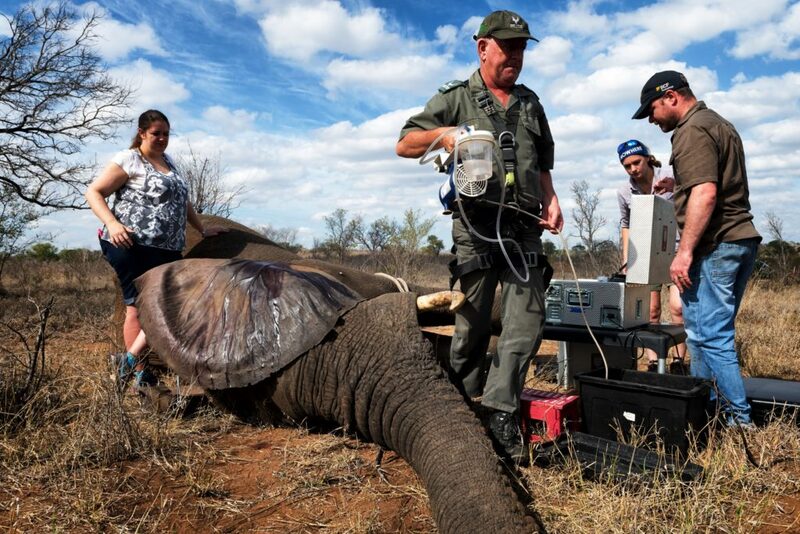 Chemical immobilization is a vital tool for SANParks’ conservation missions, and one that is used regularly in Kruger National Park for a variety of large mammals. As of October 2018, more than 50 black rhinos in Kruger National Park were individually identifiable by ear notches. Chemical immobilization is also used to recover young animals — whether black or white rhinos — that have been orphaned by poaching incidents. Once sedated, very small calves are sometimes loaded directly into the helicopter and flown to an orphanage outside the park’s boundaries, while larger animals may be slung out by their forelegs, or loaded into crates and trucked to bomas to grow up in safety. The elephant darting that took place during our visit was in service of several research projects, approved by committees well in advance. 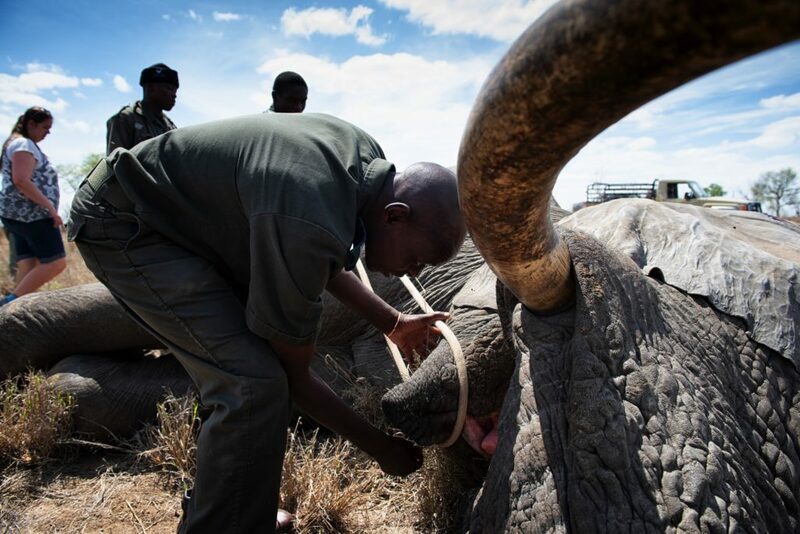 The primary research objective was to study how the sedative drugs themselves affect the elephants physiologically. A secondary research goal was to screen the elephants for tuberculosis (TB). This bacterial disease is widespread in water buffalo within the park, but it hadn’t been seen in elephants until two years ago, when the necropsy of a dead elephant here revealed that the animal had suffered from advanced TB. According to Buss, the extensive preparatory work involved with this type of research means that the actual darting of animals in the field is just a small part of his responsibilities. But he said it’s also the most enjoyable aspect of his job, and his aerial vantage point is part of that.